The name “Straffe Hendrik” (literally meaning : Strong Henri) refers back to the family history of the Halve Maan brewery in Bruges (Brugge). The beer is named after members of the Maes brewing dynasty, whose sons for the past five generations have been called “Henri” or “Hendrik” : the French and Dutch variations of Henry. Even today, the beer is still brewed to the same original recipe in the same unique setting in the hart of medievil Bruges. Brewery De Halve Maan is the last brewery operating in the old city centre. The Straffe Hendrik Heritage is a special version of the well-known Straffe Hendrik Quadrupel. The dark and heavy beer is allowed to mature for more than a year in oak casks in the brewery’s cellars, which date back to the Middle Ages. This gives the beer a very complex flavor. The tannins form a harmonious unity with the rich aroma’s & taste of the special malts. Straffe Hendrik Heritage is a beer that can be kept for several years, during which time the taste will further evolve in the bottle. As it gets older, a hint of Port or Madeira wine will become more pronounced. Only a limited quantity of numbered bottles of this unique beer are being brewed. Straffe Hendrik Heritage 2011 is now available @ Belgiuminabox.com per bottle and per set of 3 bottles in a classy wooden box. Kurt from Brewery De Halve Maan in Bruges. Last week, August 23 2012, I visited Cantillon Brewery at the Geudestraat in Brussels to pick up some glassware and to stock up on the Cantillon Geuze and Kriek. I also was there to learn about the release of the 2012 Cantillon Fou Foune. Jean Van Roy, the master-brewer, confirmed me this year’s Fou Foune would come in bigger numbers than last year. Hey Hey !! This has to do to the fact that there won’t be any Lou Pepe Kriek, because – here’s a piece of biology lesson – there was a shortage of bees to furtilize the Schaerbeekse cherrie trees. That left Jean with some extra Lambic which he could now use to make more of the Fou Foune. Due to the hot Summer we are experiencing here in Belgium this year, Jean is not capable of processing and bottling the Fou Foune at this point in time. The extreme Summer heath is unfavorable and is causing a delay in the release of the Fou Foune, which is now due end of September. This all shows, we are – still – at the mercy of the birds and the bees, nature !! 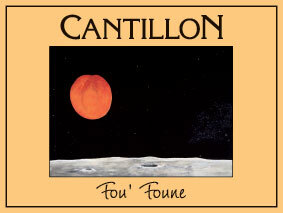 Fact 1 : Cantillon Fou Foune is made with 1,200 kg of French Bergeron apricots for 3,000 litres of Lambic in total. Fact 2 : Each year 4,000 bottles of Cantillon Fou Foune are distributed around the world, in equal numbers per country. Fact 3 : Kurt is trying to get as much of the Fou Foune he can put his hands on. Yup, that’s right! 3 Fonteinen joined forces with Belgiuminabox.com as official shipping partner during the ‘Open Beer Days 2012’! 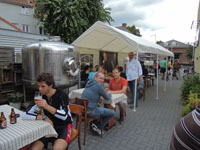 Each year the Open Brewery Days at 3 Fonteinen and Brussels Beer Weekend on Brussels’ main square is attracting more and more beer-fans from around the world. This let Armand, the brew-master from Geuze-Brewery 3 Fonteinen, to work together with online beer-shop Belgiuminabox to have the shipping done for people visiting the brewery, during the Open Brewery Days. Many people want to take home the special and rare bottles they’ll buy at the brewery. It will now be possible to have it shipped safely and conveniently to your home or business address . This will be done with Belgiuminabox’s year-long international experience with sending beer boxes to every corner of the world. Brewery 3 Fonteinen is opening their brand-new brew-room for the public during the Open Brewery Days that are held between Thursday August 30th and Monday September 3rd 2012. Lambic-Brewery/Geuze-Brewery 3 Fonteinen is inviting all Geuze & Fruit-Lambic fans to check out the new 4,000 litre brew-installation during the Open Beer Days. Armand & Lydie are very proud to show their loyal clientèle and beer-fans alike that again there is “life in their brewery”. Due to the huge international appeal, free tours around the brewery are held in 3 languages: Dutch, French and English. The brewery doors open every day from 10 am till 5 pm and there’s enough beer to be tasted during the entire weekend. 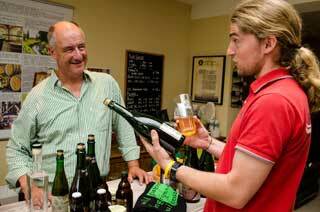 3 Fonteinen will continue their year-old tradition by offering vintage Oude Geuze & Oude Kriek for sale. Those beauties are not found for sale at regular beer-stores across Belgium. You can also enjoy regional specialties for lunch or dinner @ Restaurant 3 Fonteinen! Are you afraid of being too heavy loaded with all those great beers ? No problem there ! The brewery and Belgiuminabox.com is working together during the 3 Fonteinen Open Beer Days to do their shipping. 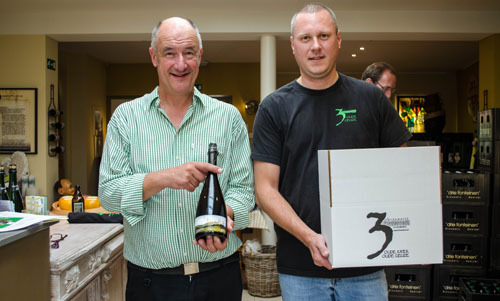 You can even combine a purchase from Belgiuminabox.com with bottles you’ll buy at 3 Fonteinen in 1 shipment! I will also attend the Brussels Beer Weekend Festival on Brussel’s main square and the 3 Fonteinen Open Brewery Days at Beersel, where I look forward to catch up and meet with a lot of beer-fans. Don’t miss your appointment with brewery 3 Fonteinen and mark it in your beer-calendar !